In the early part of the twentieth century, Harlem was a hotbed of intellectual, artistic, literary, and political blossoming for Black people. McKay's poetry could be called protest poetry as he attacked social issues head on. His poem, "The Lynching," is a prime example. To read the complete poem, click here. American Teens--What Are They Missing? •43% knew the Civil War was fought between 1850 and 1900. •52% could identify the theme of 1984. •51% knew that the controversy surrounding Sen. Joseph McCarthy focused on communism. I don't know about you, but I find the idea that 57% of teens couldn't place the timeframe of the Civil War within a 50 year period to be pretty disturbing! Hirsch, E.D. 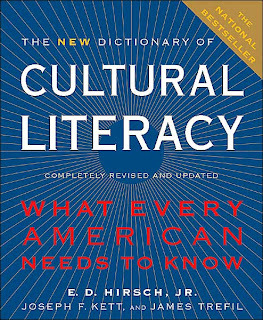 The New Dictionary of Cultural Literacy: What Every American Needs to Know [R 973 HIR]. If you're a parent, don't despair--I bet your teen can tell you how to program your cell phone! Lately there has been a discussion on a NH libraries' list going on about favorite book discussion titles. Not all of the titles are recently published, which leads me to a rant. Ready?... I think many book discussion groups do themselves (and the interlibrary loan librarian) a great disservice by insisting upon reading the "hottest" new titles. There are vast numbers of interesting and highly discussable books that have been overlooked by groups, and that would be easy to get from other libraries, thus alleviating the need to hunt down copies. It would also save book group members from having to purchase copies if none are available through ILL. In 1962, at age seventeen, Karen Armstrong entered a convent, eager to meet God. After seven brutally unhappy years as a nun, she left her order to pursue English literature at Oxford. But convent life had profoundly altered her, and coping with the outside world and her expiring faith proved to be excruciating. Her deep solitude and a terrifying illness-diagnosed only years later as epilepsy-marked her forever as an outsider. At fifty-two, Professor David Lurie is divorced, filled with desire, but lacking in passion. An affair with one of his students leaves him jobless, shunned by his friends, and ridiculed by his ex-wife. He retreats to his daughter Lucy's isolated smallholding, where a brief visit becomes an extended stay as he tries to find meaning from this one remaining relationship. Chronicles the American experiences of Angus McCaskill and Rob Barclay, Scottish immigrants, who lived for three decades in Two Medicine Country at the base of the Rocky Mountains. God's Kingdom in its pure, unenlightened glory. So fourteen-year-old Leah Price expects when, in the summer of 1959, she arrives in the Congo with her family....From 1959 through 1998, the Price sisters tell their stories, in alternating narratives that reflect their ages as the years pass and the understandings that they achieve. When Edgar Drake is summoned to the British War Office and asked to tune an eccentric major's 1840 Erard grand piano in the jungles of Burma, he is both confused and intrigued. The year is 1886, and the British Empire is attempting to tighten its control of its colonies in the Far East, to fend off French rivals in the Mekong Delta, and to quell the resistance of a confederacy of local Shan tribes in northern Burma. In the vice president's mansion in an unnamed South American country, a lavish party is taking place to celebrate the birthday of a visiting Japanese businessman. An American opera singer is entertaining the guests, dignitaries and high-ranking officials from around the world, when suddenly the room is plunged into darkness. Terrorists invade the mansion and set in motion a series of events that irrevocably alters the life of every person involved. If your book group is looking for titles, a favorite site to explore is Reading Group Guides: The Online Community for Reading Groups. This site has recommended lists of titles and discussion questions for several thousand books. I highly recommend it! The 80th Annual Academy Awards took place on Sunday. With the quick transition from general release to DVD release we have quite a few of the winners already on our shelves! The Bourne Ultimatum [DVD BOU]--"Best Editing," "Best Sound Editing," "Best Sound Mixing." Ratatouille [J DVD RAT]--"Best Animated Feature." La Vie en Rose [DVD VIE]--"Best Actress in a Leading Role," "Best Make-up." No Country for Old Men, which won "Best Picture," "Best Director," "Best Adapted Screenplay," is still in theaters, but you can read the book by Cormac McCarthy [F MCC]. The DVD will be released on March 11, at which time we plan on purchasing it. Away from Her [DVD AWA]--nominated in the "Best Actress" category. Elizabeth: The Golden Age [DVD ELI]--also nominated in the "Best Actress" category. Surf's Up [DVD SUR]--nominated in the "Best Animated Feature" category. To see some of the glamor of the Sunday's award ceremony, Internet Movie Database has a photo gallery for you to enjoy. Hooray for Hollywood! 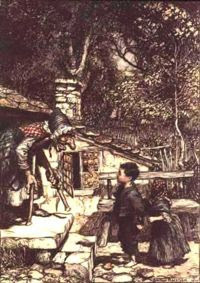 Hansel and Gretel is an old German tale that comes to us via the Brothers Grimm. (Read the story in The Complete Fairy Tales of the Brothers Grimm [398.21 COM].) We have several picture book versions in our children's room, including the Caldecott Honor award winner illustrated by Paul O. Zelinsky [JP HAN].) I'm sure you remember the story, so I won't bother to summarize it, but, in reading the Grimm version in The Complete Fairy Tales, I found that a duck ferried Hansel and Gretel to safety after their escape from the witch. I don't remember a duck in any version I have seen previously. Of course, in adapting a tale for a picture book, one would tend to eliminate anything that is not essential to the story. But it leads me to speculate about the reasons for the duck to begin with. Besides reading the story, you can listen to the opera version by Engelbert Humperdinck [CD OPERA HUM]. We recently purchased the CD with Sir Charles Mackerras conducting the Philharmonia Orchestra (London) because it was awarded a Grammy this year for "Best Opera Recording." If you want a real treat, the Boston Lyric Opera is performing Hansel and Gretel on Sunday, April 13, at John Hancock Hall. Click here for more information. I just finished a wonderful book, Home of the Brave by Katherine Applegate [J APP]. Home of the Brave is a novel in verse about a young immigrant boy from Africa who arrives in Minnesota in the middle of winter. In one of the early poems, "God with a Wet Nose," Kek sees a cow out of a car window and asks the driver to stop. a harsh and mournful sound. It isn't the fault of the cow. She doesn't know another way to talk. right there in my hand. The poems are evocative and moving. Any child reading them will surely stop to think about how difficult it is to find one's self in a place where everything, from the language to the schools, is unfamiliar. I'm a softy, I believe that books for children should end, if not happily, at least with hope. Home of the Brave has both--hope and happiness--what more could you ask for! Rubber Duckie, You're the One. You Make Bathtime Lots of Fun. Rubber Duckie I'm Awfully Fond of You. This Saturday, if you're up for a little trip north, there will be a Winter Wildquack Duck Race being held at Black Mountain in Jackson. This is the third year the race will be held. 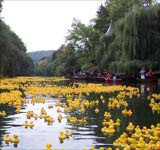 Rubber duck races are fairly popular events during the warmer months, when the ducks can actually float. In Jackson, the ducks will have to slide to the finish line. 10 Little Rubber Ducks by Eric Carle [JP CAR]. Find the Duck by Phil Cox [BB COX]. Bubble Bath Pirates by Jarrett Krosoczka [JP KRO]. The Runaway Duck by David Lyon [JP LYO]. The Runaway Duck isn't about a rubber duck, but the toy duck in the story does float away on a grand adventure! Do you have the "Rubber Duckie" song now running through your head? If so, borrow Splish Splash: Bath Time Fun [CD CHILDREN SPL], and you can learn a whole bathtub full of rubber duck songs! I've heard it said that trees are the lungs of the earth. It makes perfect sense--they take carbon dioxide and then release oxygen, much like human lungs do, of course, our lungs do it in reverse! We all know about the excess of paper used in junk mail. In the year 2006, 212,345 MILLION pieces of domestic mail moved through the U.S. Postal service. (That number is from the Statistical Abstract of the United States: 2008 [R 317.3 STA]) It's amazing that there are any trees left at all on Earth! And remember how computers were supposed to make ours a "paperless" society? Founded by a handful of concerned citizens in 1901, The Society for the Protection of New Hampshire Forests is now one of the country's most effective statewide land conservation organizations. As a non-profit membership organization, the Forest Society is dedicated to protecting the state's most important landscapes while promoting the wise use of its renewable natural resources. If you want to explore our state's forests, the Society has a listing of its conserved properties available to download. Winter hiking is good exercise, and, as long as our forests remain conserved, you can breathe deeply. The news today told of Fidel Castro's resignation after 50 years in power. Maybe we'll see the day when Cuba will be a vacation destination that Americans can enjoy--I guess it all depends on who is next in charge (both here and in Cuba). I checked the catalog under the subject heading, "Cuba--Description and Travel" and was surprised to find we had a book listed under that heading. When I clicked on it I found the title to be, Two Years before the Mast and Other Voyages by Richard Henry Dana, Jr. [910.45 DAN]. Two Years before the Mast was originally published in 1840! Wanna bet the island has changed somewhat in the past 168 years? Eire, Carlos. Waiting for Snow in Havana: Confessions of a Cuban Boy. [B EIR]. Garcia, Cristina. The Aquero Sisters. [F GAR]. The library is closed for President's Day today. Next year, 2009, will be the 200th anniversary of the birth of Abraham Lincoln. I imagine there will be an avalanche of books and television programs coming out a year from now. He succeeded as a war leader, says Wheeler, because he learned to manage the news and shape public thinking and policy by communicating directly with multiple interests. 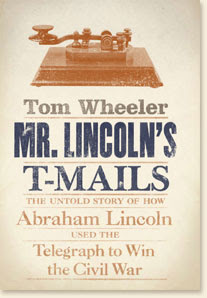 If Wheeler sometimes exaggerates the effects of the telegraph in "winning the war," he taps out a lively account that crackles with revealing anecdotes and insights, offering new ways to appreciate Lincoln's genius as a policymaker. There is a companion website to visit, too. George Washington is not nearly as popular a subject as Lincoln, but still, there are always books being written about him. Here's a fairly recent children's book: George Washington, Spymaster: How the Americans Outspied the British and Won the Revolutionary War by Thomas B. Allen [J B WAS]. Interested adults can go to this site for a quick overview of Washington, "spymaster." For information about all the presidents, visit the Miller Center of Public Affairs site. The Miller Center has essays, papers, and audiovisual sources. American Life in Poetry: This is a project started by former U.S. Poet Laureate, Ted Kooser. The sole mission of this project is to promote poetry: America Life in Poetry seeks to create a vigorous presence for poetry in our culture. Although this project is focused on getting poetry into newspapers, you can sign up for a poem to be delivered to your inbox each week. 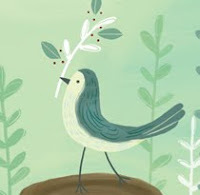 Shakespeare's Sonnet a Day site actually sends out sonnets three times a week! Verse Daily sends out poems each day, and, they are poems from reputable publishers, not those submitted by the general public. 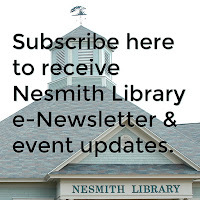 By republishing from fine literary magazines and books of poetry one new poem each day, Verse Daily is working hard to promote poets and their publishers while providing a wealth of excellent poetry to the public free of charge. Garrison Keillor of "Prairie Home Companion" fame, records a daily Writers Almanac in which he reads a poem and comments on the day in literary history. Sign up here. Take advantage of these wonderful opportunities to have your poetry delivered directly to your home, and, there's no tipping involved! If you were planning on taking your sweetie out to dinner tonight, forget it--you'll spend hours walking around with one of those little beepers waiting for a table. Valentine's Day evening is probably the busiest time for restaurants. Instead, why not borrow one of the library's films and have a fun evening cosying up on the couch. You won't be considered cheap if you promise to treat him/her to a romantic dinner-for-two at some later date--like tomorrow! The American Film Institute issues lists of films in categories. For tonight's special film check out AFI's 100 Years...100 Passions. (Keep in mind that the title is "100 Passions" not "100 Romances"! This posting is late today. I've been preoccupied with the weather and the results of a reckless driver. Another thing that has me slightly off-kilter is that, once again, a snow plow has taken out my mailbox! This happens at least once a year, and since we've had a gazillion snowstorms this winter without mailbox murder, I thought I was free of the plow curse. Hah! I could be vengeful, but that's self-destructive, so, I'm going to think happy thoughts. Who needs a mailbox when all you get is junk mail anyway? And snowplows aren't really evil. Actually I'm quite happy to have them clearing the roads. See, happy thoughts! There's one book that I know of that has a snowplow as a main character--Katy and the Big Snow by Virginia Lee Burton [JP BUR]. Katy was originally published in 1943--an oldie but goodie. Virginia Lee Burton was born in Newton Centre, MA in 1909. She lived in the area for her first 8 years, but the memories of snowy winters must have remained strong. While you're at it, look for Burton's other classic, Mike Mulligan and His Steam Shovel [JP BUR]. The Historical Society is holding a "C" dinner tonight at the Town Hall. There was a nice write-up in yesterday's Eagle-Tribune. A formal or fashionable social event, often held in someone's honor: a less formal social gathering, often held as a fundraiser. In 1892, for an admission price of 40 cents, you got a "C Supper Bill of Fare," i.e., all the food began with the letter "C." Some of the items served were clam chowder, cranberry pie, chicken, cheese, crabapple tarts, and coffee and Chinese tea. 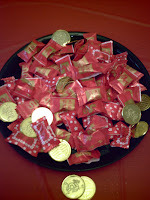 Tonight, the price is still 40 cents, but you are asked to bring a confection, otherwise known as a dessert. Tonight's dishes will be chili, corn chowder, chicken, etc. I'm planning on bringing a cherry something for dessert (nothing like waiting until the last minute to decide). I checked two online inflation calculators to see what 40 cents would be in today's prices. One calculated the cost would be $9.12, the other estimated the cost at $8.65. 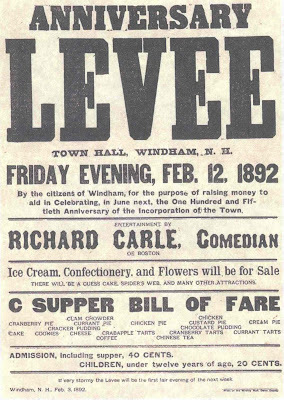 Not only was there food, but there was entertainment back in 1892--"Richard Carle, Comedian of Boston," and there was a "guess cake, spider's web, and many other attractions." The spider's web has me intrigued! I'll have to ask the Historical Society's members if they know what it was. 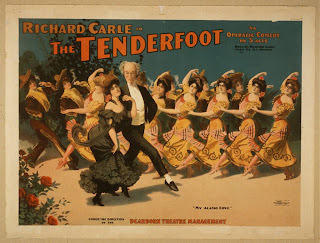 Richard Carle was a renown comic actor. You can find him mentioned this old volume from our theater section: A Pictorial History of the American Theatre, 1900-1956 by Daniel Blum [792.09 BLU]. Like origami for instance, I've written about origami several times--the most recent in October. Have you heard about the origami space craft? I heard a brief mention on the radio and then found this article. Sounds crazy, but a lot of what we take for granted now, originally started as someone's crazy idea! Most of us have grown up folding paper airplanes, and the interest in doing so, is evident in the number of paper airplane books we have in our collection, from Super Simple Paper Airplanes by Nick Robinson [745.592 ROB] for adults, to the children's book, Flying Things by Michael DiSpezio [J 745.592 DIS]. Flying Things not only gives paper folding instructions, it teaches the physics of flying! The folding of paper airplanes even has its own name--aerogami! 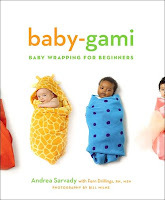 If you need a baby gift idea, look for Baby-gami: Baby Wrapping for Beginners by Andrea Sarvady [649.122 SAR], described as "origami meets the age-old art of swaddling." The book is a delight if for no other reason than its colorful pictures! It's like a snake that crawls into a hole. What man can stop us losing the last trace? No matter how we try, we can't succeed. Happy New Year everyone, and don't forget our celebration being held tomorrow at 10:30 am. 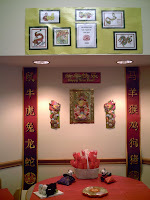 Here are some photos of our multipurpose room all set up for the gala! 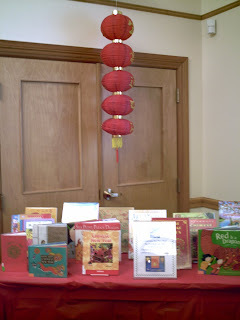 A display of a portion of our children's books on the Chinese New Year. Where Were You On This Date in 1978? Back then I was working at Wellesley Office Park, right off of 128, in Massachusetts. 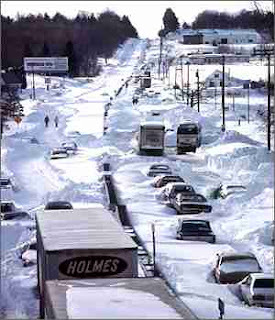 I was one of the lucky ones, I was able to leave work early enough the day before to miss the worst of what is now known as the "Blizzard of '78." Some of my co-workers were not as lucky and spent hours and hours stuck in their cars. Fortunately, up here in southern New Hampshire, we only got about half the amount of snow that they got in the 128 area, so it was rather nice to spend the rest of the week at home. One incredibly long snow day! The NH seacoast, though, was pounded pretty badly. If you were too young to remember the Blizzard of '78, then you'll find pictures here, and more links to Blizzard information. For you oldies, we are now far enough removed from the experience to enjoy the details of that day, so, borrow this book and take a trip down memory lane: Tougias, Michael. The Blizzard of '78 [551.555 TOU]. 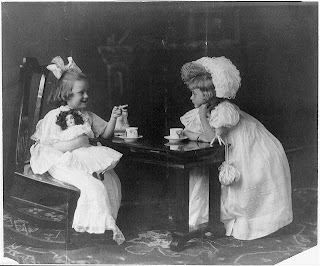 What's the good of discussing teatime if you don't discuss tea? 1 Put a few leaves in the water when boiling eggs. Try boiling some with green tea and some with black for variety. 2 Be sure to save brewed leaves for the compost bin. 3 Remember the tips of the Victorian era: cold stewed leaves were used to polish glasses and mirrors. Tea leaves boiled up in pans remove smells. Steeped in Tea: Creative Ideas, Activities & Recipes for Tea Lovers by Diana Rosen [641.3372 ROS] has a chapter called "Looking into the Future with Tea" with "A Guide to Common Tasseography Symbols." You could plan a little theme teaparty, dress as a fortune-teller, then surprise everyone with your knowledge of tasseography. I'd be impressed! Maybe some summer you could go to London and have tea with the Queen. It is quite an event, but not exactly what I'd call intimate--imagine having to make polite conversation with 8,000! I wonder if the Queen's staff uses the tea leaves from her parties to make the castle mirrors shine? I somehow don't think Chuck has had many lessons in etiquette, but perhaps I'm guilty of stereotyping--maybe he would be perfectly capable of making polite conversation while sipping tea. How are you in doing in the area of manners? There are guides to etiquette being published today--well-behaved people are always in fashion! One in our collection is Letitia Baldrige's New Manners for New Times: A Complete Guide to Etiquette [395 BAL]. Table Manners for Kids...Tots to Teens [FT 395 TAB] is one of several VHS tapes on teaching your kids how to behave; this one is found in the First Teachers Section of the Children's Room. We also have a set of books called First Facts: Manners [J 395.122 DEG] by Terri DeGezelle. Once you've brushed up on your etiquette, you may want to practice your skills at a local tea shop. Check out listings here. Have fun and don't slurp! I don't often find it hard to come up with ideas for my weekday postings. Just this weekend I awoke in the middle of the night with the idea of writing about some absolutely wonderful book. The thing is, the book was a dream, and when I fully gained consciousness, I had no idea what the book was. Yet, this odd dream led me to think about dreams. 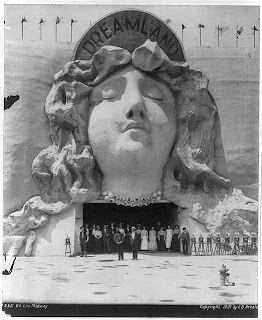 Sigmund Freud's classic work, "The Interpretation of Dreams," (found in The Basic Writings of Sigmund Freud [150.1952 FRE]) delves into dreams as a form of wish fulfillment. I can't imagine how my dreaming about writing my blog is wish fullfillment, so I'll have to look elsewhere for an explanation of my dreams! She explains how all dreams are ultimately "friendly," because they carry messages with the dreamer's best interest at their heart. Dreaming about blogging is friendly? Nah! Okay, one last book, Zolar's Encyclopedia and Dictionary of Dreams: Fully Revised and Updated for the 21st Century [135.3 ZOL]. No surprise--blogging is not an entry! Too bad, because Zolar also includes "lucky numbers for fun and profit," and I would have made my way to the convenience store for a lottery ticket! Still, I did take advantage of my dream by uncovering a topic to post on! A few weeks back I briefly spoke about the 2008 Newbery Medal winner, Good Masters! Sweet Ladies! : Voices from a Medieval Village by Laura Amy Schlitz [J 812.6 SCH]. I failed to mention in that posting that the poems in the book were written as monologues and dialogues. Tuesday, on Here and Now, Laura Schlitz was interviewed and parts of her book were read aloud. You get a completely different feeling by listening to the poems rather than reading them. I highly recommend it! We have audio versions of poetry in our AB section. One, available in cassette form, is Donald Hall: Prose and Poetry [AB 811 HAL]. Hall, a resident of our fair state, was recently a U.S. Poet Laureate, and he reads from his work in this recording. The collection, 81 Famous Poems: An Audio Companion to The Norton Anthology of Poetry, Third Edition, Regular and Shorter [AB/CD 808.81 SCO], has many readers, including Alexander Scourby, one of television's most recognized narrators. 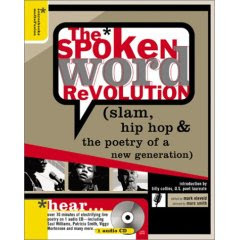 Also look for The Spoken Word Revolution: Slam, Hip-Hop & the Poetry of a New Generation [811.508 SPO] which includes, "over 70 minutes of electrifying live poetry," along with a book.